McKinsey’s recent global survey suggested that 80% of companies are investing in Web 2.0 technologies. Web 2.0 technologies are no longer restricted to social networking site but forming backend to enterprise level applications. This evolution is giving rise to next generation application hacking and attack vectors. It is imperative to understand these new attacks and scanning methods to detect vulnerabilities. This presentation will be full of real life cases, live demonstrations, new tools and techniques along in-depth coverage on the latest concepts and methodologies. Session Abstract: Ajax, web services and rich Internet (Flash) are redefining moves on the security chessboard. Attack strategies are emerging like cross-site scripting with JSON or cross-site request forgery with XML. 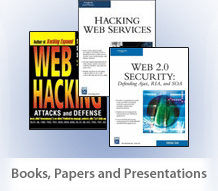 This session will cover Web 2.0 attacks, tools for assessment, and approaches for code analysis with demonstrations. Professionals can apply knowledge in real life to a secure Web 2.0 application layer. You can go through my presentation and research work on iHTTPModule and CSRF. I have posted them on slideshare. Here is the posting you can view over here or go to the slideshare. Speaking on iHTTPModule with IIS 7.0 integrated pipe. It can help in building defense by creating WAF. Also, addressing CSRF and security controls around it. Looking forward to meet some of the application security folks as well. Having 2 days workshop for ISACA in Dubai. Look forward to meet some of UAE folks. Cheers!